When you deploy any PeopleSoft 9.2 Image on Virtual Box, it installs all the required components like Database, App server, Web server and Process Scheduler. Depending on your choice at the time of installation, SES can be configured too. 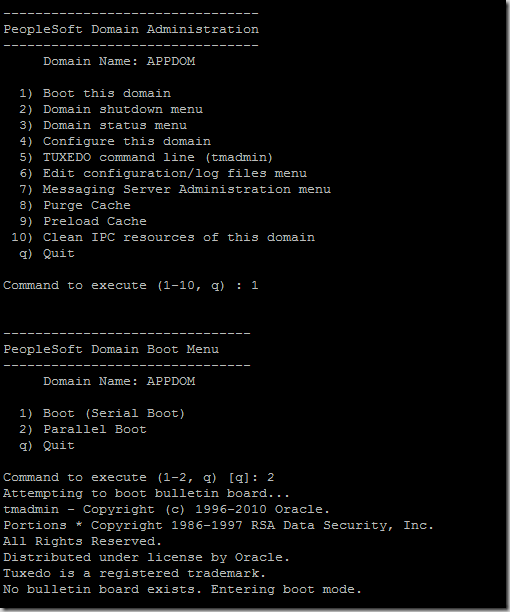 When you boot this virtual machine, it will start all the above mentioned components automatically and you just need to enter the PeopleSoft URL in the browser to access the PeopleSoft environment. This sounds good as there isn’t much administration to do. But there might be scenarios, when you want to administer PeopleSoft components to resolve some issues or for testing purposes. 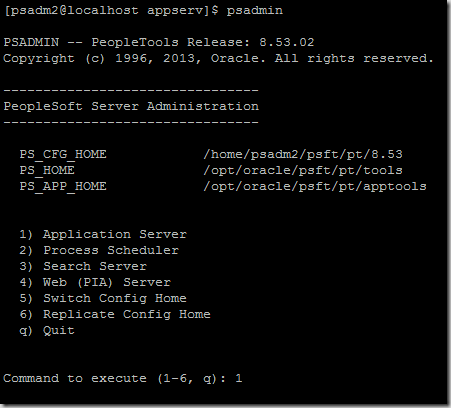 As this virtual machine has multiple ids which owns different components, this post will help you in administering the PeopleSoft 9.2 application installed on Virtual Box. 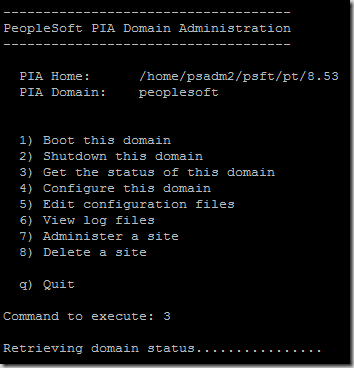 If you haven’t already installed PeopleSoft 9.2 Image on Virtual Box, you can follow this post to do the same and then head over to below post for further administration tasks. 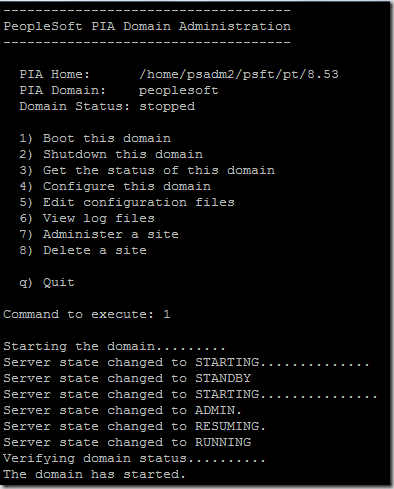 Using putty, connect to the VM machine ( you can get the IP by running ‘ifconfig’ command inside VM) and enter the root login details. Password for root was specified at the time of VM installation. 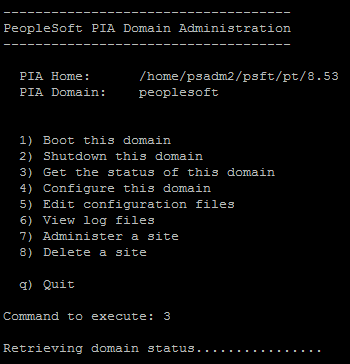 PS_CFG_HOME (PeopleSoft Configuration Home) is owned by psadm2 user, which means that you would need to use this id to administer PeopleSoft Application Server and Process Scheduler and edit any configuration files. 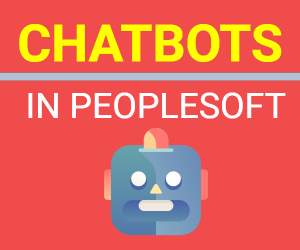 Note: To learn about all the different PeopleSoft Homes, read here. Location of PS_CFG_HOME is /home/psadm2/psft/pt/8.53. 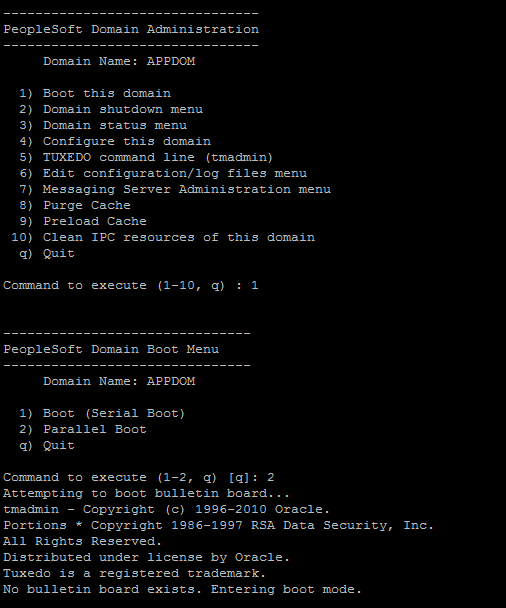 This is where you will find the appserv directory and the default app server domain (APPDOM) configuration files. While logged in as psadm2 user, navigate to PS_HOME/appserv directory. Now invoke psadmin from here. You will see a list of domain that can be administered. 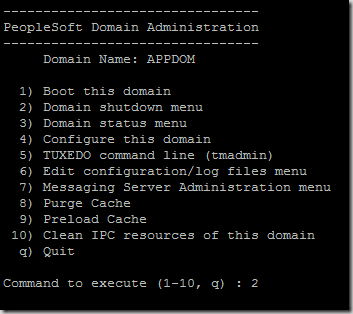 As PeopleSoft 9.2 Virtual application is configured with only one default app server domain, this list will have only one entry (APPDOM). Choose ‘2’ to go to Domain shutdown menu. Given the choose to do either a normal or forced shutdown. Choose as desired. In below screenshot I have chosen option 2 i.e Forced shutdown. 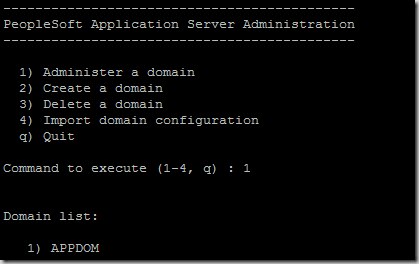 As soon as you enter the option, shutdown of application server will process. Once shutdown is finished, you will return to domain administration menu. 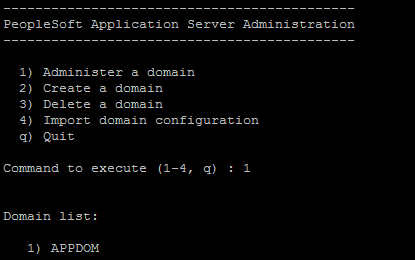 In Domain Administration menu, choose ‘1’ i.e Boot this domain option and then enter 2 for doing a parallel boot of your application server domain APPDOM. 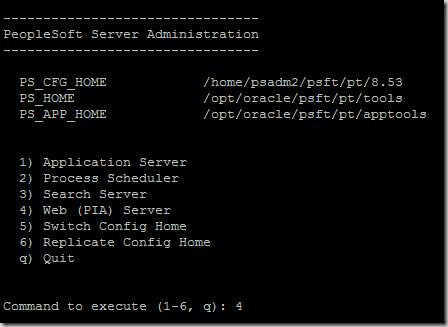 Once all the services will be up, you application server is ready to respond to request from PeopleSoft Webserver. 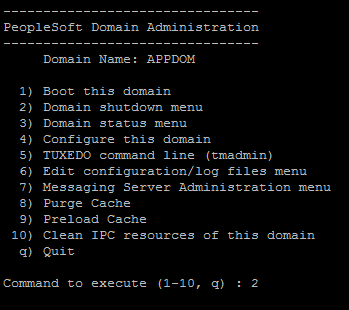 psappsrv.cfg for app server domain APPDOM can be found at /home/psadm2/psft/pt/8.53/appserv/APPDOM. 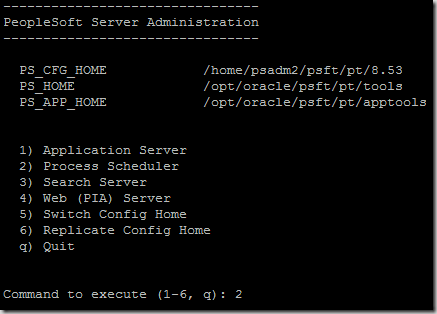 If you need to edit application server configuration files, make sure you’re logged in as psadm2. Similar to Application Server you can administer PeopleSoft Process Scheduler using option 2 for Process Scheduler. 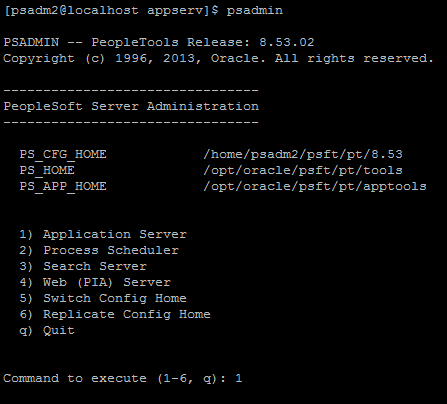 Invoke psadmin from PS_HOME/appserv directory using psadm2 user. 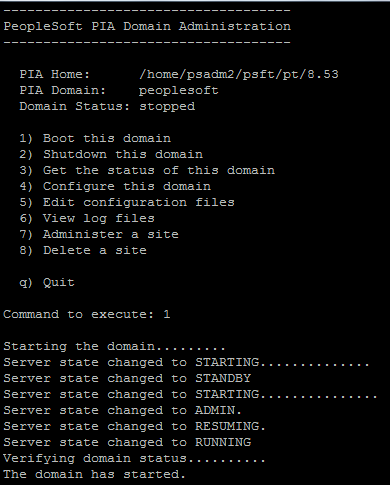 Choose option 4 for ‘Web (PIA) server’. 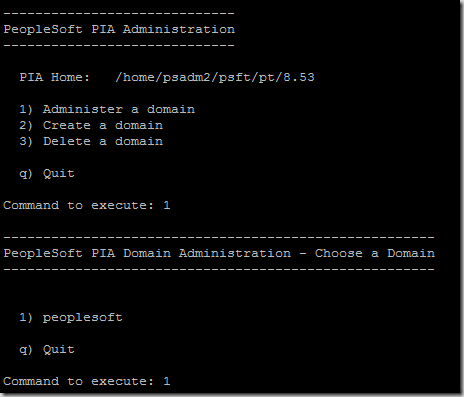 You will enter PeopleSoft PIA Administration menu now. Enter 1 to choose ‘Administer a domain’. It will show available domain that can be administered. 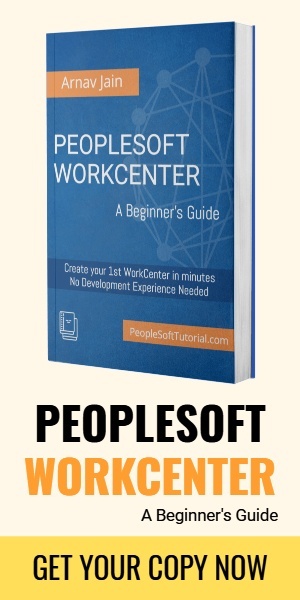 Enter 1 for ‘peoplesoft’. 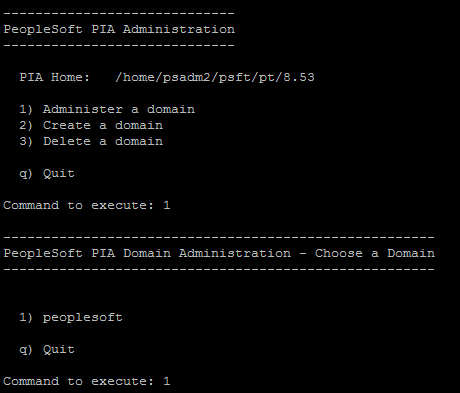 To check the status of this PIA domain enter ‘3’. It will take few seconds and then will display the status. It will show the shutdown status and then return to admin menu again. 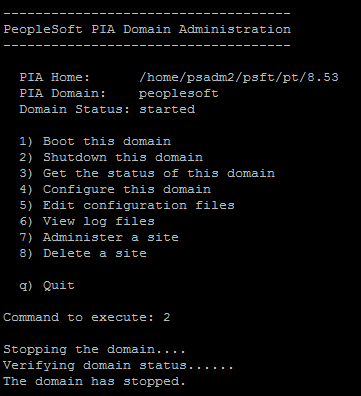 In PeopleSoft PIA Administration Menu, enter 1 to boot the domain. 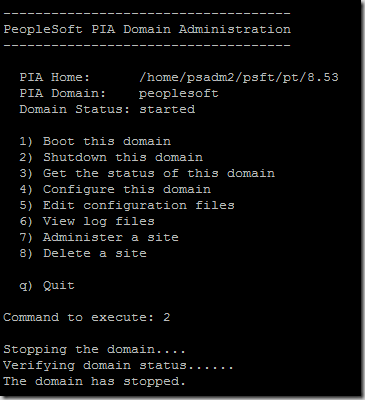 PeopleSoft Webserver domain will be started. If you face any issue that you would like to share with the community, please add those to comment section below.